Leinster will be wondering how they did not start the Interpros with a win after Keith Black’s 69th minute goal gave the Northerners a share of the spoils. Ulster did start the game in the ascendancy but a scintillating 20 minutes in the second half should have put Leinster into a commanding lead. 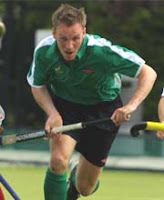 The game’s crucial moment came when Andy McConnell put through Gordy Elliott to score into an open goal but he inexplicably pushed wide from a tight angle. With Leinster leading 3-2, the Munster man next to me said straight away “this is a nailed on 3-3 now”. And he was proved right by Black’s late show. Ulster’s potency up front was almost proven in the second minute when Timmy Cockram burned past Neil Lyons before his shot drifted wide. They did not have long to wait, though, as Mark Irwin showed what Ireland were potentially missing in New Zealand, as he tore down the right wing and then flipped the ball over Ian Walker from the end-line. He doubled the lead when Cockram intercepted to give Irwin the simplest of chances for 2-0 in the 23rd minute. It could have been worse for Leinster when Eamonn Bane appeared to take down Irwin on the 25. Umpire McCully looked set to sin-bin the player before David Smyth classily intervened to calm the situation. And the Blues got their lifeline just before the break, when Andy McConnell – one of the game’s outstanding players – stole the ball before setting up Alan Sothern for a smart finish, chippng the ball to himself before burying past Gareth Lennox. Sothern then created the equaliser, banging the ball at Mitch Darling who seemed to know little about the finish but got enough of a deflection for 2-2. Leinster were now playing superb hockey, David Robinson flying down the flank from right back on his debut and Dave Bane influential after recovering from a first half head injury with suitably Donnacha O’Callaghan-esque head-dress. Ulster were becoming increasingly ragged with Irwin and Johnny Jackson green carded before Geoff McCabe was sent to the bin for a trip on Alan Browne. Robinson won the penalty corner for Sothern to take the lead with 20 minutes left. The Blues continued to dominate but could not press home the advantage but as the game closed out they began to sit further and further back. Elliott missed his chance before Robinson was forced off with a suspected dislocated shoulder as Leinster let their superiority slip. Joe Brennan was twice caught dithering in possession before a penalty corner was conceded with three minutes remaining. Ian Walker made an initial save before Dave Bane took a shot off the line. But they were not to hold on, as Black got the tie with just 40 seconds left.